1. Newspapers. Besides the fact that posting an ad in an influential newspaper, be it local or national, is expensive, the newspaper is usually read only once. This means that: 1. you’ve only got one chance to make a good impression; 2. there’s no way to measure your ad’s number of views; 3. you’re relying on the reader to remember your message and do something about it. With digital signage you can overcome these risks by making sure that your message is seen, read and delivered in an environment where people can take an immediate action (purchase, register, ask for more information etc). 2. Magazines. The cost per ad per issue easily reaches hundreds of pounds/ dollars/ euros and you can’t update the ad copy until the new release. This usually takes two weeks so if your ad/ message contains any incorrect or outdated information you can’t do anything about it. The main advantage of digital signage is the instant update of data. You can change your screen content in a few clicks and publish your news within minutes. Flexible, quick and at a cost of less than 20 pounds a month. 3. The Yellow Pages– are amended once a year and their category- style implies that your ad/details are grouped with those of your competitors’. When advertising and communicating via information screens you get the spotlight and your audience’s undivided attention. 4. The Radio– remained a good way of reaching a large audience but you can only hope the listeners will remember you & and important details about you such as your website address. As most people are visual, a written message brought in a meaningful context has a much higher chance of being recalled and acted upon. 5. Internet. Online advertising is indeed a cost- effective, flexible way of delivering your message to your target audience. Its only limitation is that you can’t control where your ad is going to be viewed. The digital media screens on your premises complement your online marketing strategy by ensuring that your message is seen not only by the right people but also at the right time and in the right place. Implementing a digital signage project doesn’t eliminate the need for other marketing efforts. Clear Channel’s study and the 2011 UK Digital Out of Home report acknowledge digital signage’s complementarity of other advertising vehicles, provided the communication strategy is clear and harmonious across all channels. Digital signage has the potential of not only increasing sales but also enhancing the sales produced by other media. 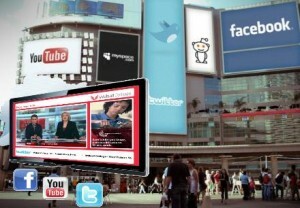 To find out more about digital signage download our whitepaper or contact us. This entry was posted in Digital Signage, Marketing and Advertising and tagged digital signage by Dynamax. Bookmark the permalink.